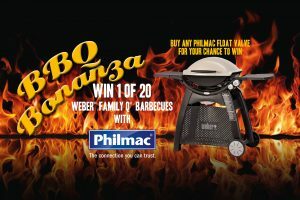 Congratulations to our 20 winners in the Philmac BBQ Bonanza competition. Not only do they have an incredibly tough float valve which they purchased to enter the competition but they now have an amazing Weber Family Q BBQ for cooking Christmas dinner. Full terms and conditions of entry are available here. Starts 9am 01/10/18; ends 5pm 30/11/18. Must be AU resident aged 18+. To enter, buy a Philmac-branded float valve from a Philmac Promotional Valve Stand in a Participating Store (Qualifying Purchase), go to www. philmac.com.au/BBQBonanza (Website) & complete entry online. 1 entry per Qualifying Purchase (multiple entries per transaction receipt not permitted). Draw: 10am 7/12/18 at Promoter’s address. Prize: 20 winners will each receive a Weber® Family Q® Titanium (Q3100) LP Barbecue valued at $739 (RRP incl GST). Total Prize Pool: $14,780 (RRP incl GST). Winners notified in writing & names published on Website 14/12/18. All times ACDT. Full T&Cs on Website. Promoter: Philmac Pty Ltd (ABN 17 007 873 047), 47-59 Deeds Rd, Nth Plympton SA 5037. Permits: SA T18/1332; NSW LTPS/18/26541; ACT TP 18/01450.